Continuous and automatic precision dosing of powders into reactors working under high pressure poses formidable technical challenges, especially where those powders are toxic or potentially explosive. Dec Group meets those challenges with a range of dosing solutions that form part of its integrated PTS Powder Transfer System approach to powder handling. 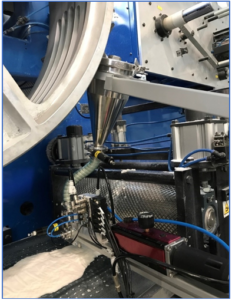 Like PTS itself, both PFL Powderflex and FlexPTS combine vacuum and pressure to offer greater control over ‘problem’ sticky powders, allowing powder extraction from any container and transfer over considerable distances. PFL Powderflex is a combined system for conveying and dosing powders that is ideal for toxic and explosive powders, allowing continuous feeding and precision dosing. These capabilities make it well suited to pilot plants, to streamline processes and in inert applications where oxygen must be excluded. The PFL Powderflex design consists of two small, calibrated chambers, each equipped with a flat filter in the upper part. A practically continuous powder flow or precise volumetric dosing is generated through a unique valve system, plus the combined effect of vacuum and pressure, which makes it possible to alternate, at high frequency, between filling and emptying the chambers. The transfer rate is easily adjusted by adapting the volume of the chamber or changing the frequency. This simple design facilitates minimal maintenance and enables rapid product changes. PFL Powderflex also ensures powder characteristics are not modified during transfer. The system is fabricated in AISI-type 316L electro-polished stainless steel, along with HC22, plastics, and other suitable materials, with various hose selections available to suit the application. PFL Powderflex offers constant feeding capability to process equipment such as reactors, dryers, jet mills, etc., with high precision conveyance and dosing to an accuracy of 1-2%. This can be further enhanced by use of a weighing device, allowing measured doses to be delivered to accuracy of ± 1g. The PFL Powderflex standard range of five versions cater for dosing quantities ranging from gram level to medium dosing quantities. FlexPTS is a new addition to the Dec range of powder dosing systems. Based on the same principles as Powderflex, it usually comes with a compact feeding hopper that can be easily integrated in line. FlexPTS is designed for even smaller volume dosing, in the 500 mg – 10g range. The device is versatile and takes up very little space, hence it can be easily integrated into existing processes. FlexPTS enables continuous dosing while achieving high precision. Oxygen exclusion makes it particularly suitable for the continuous feeding of micro reactors under pressure. Dosing speed can be set from half a second to two seconds or more depending on the application, while maintaining high dosing accuracy. The FlexPTS achieves high precision (RSD 2%) and is versatile in open or closed design. With the doser, pressure vessels or reactors containing hazardous vapors can be safely and automatically charged with explosive, toxic or other types of powders. FlexPTS completes a range of dosing options offered by Dec, which also includes µPTS for doses under 1mg and DosiValve used in combination with PTS for larger quantities. 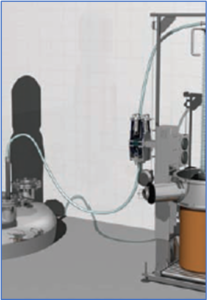 Click on Continuous powder dosing with PFL Powderflex and FlexPTS for more information. Click on PFL Powderflex for more information. 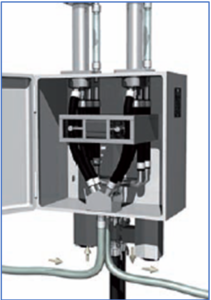 Dec FlexPTS: compact hopper design delivering small volume high accuracy powder dosing into pressure microreactors, etc. Heart of PFL Powderflex: two small, calibrated chambers interlinked with a unique valve system and operating in tandem. PFL Powderflex in typical installation charging a reactor.